Our paper, “Analytics for Education”, presents an overview of the development and use of analytics in the context of education through a critical analysis of current developments in the domain of learning analytics, and contrasts the potential value of analytics research and development with real world educational implementation and practice. The paper also focuses on the development of education content analytics, considers the legal and ethical implications of collecting and analysing educational data and highlights new developments including the exploration of data from massive open online courses (MOOCs). 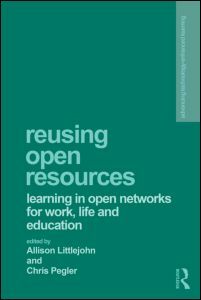 Reusing Open Resources also includes papers on a wide range of current topics including European OER policy, workplace learning in informal networks, collaborate knowledge creation and, of course, MOOCs. Several papers from this book, including ours, have already been published in a special edition of JIME, the Journal of Interactive Media in Education, Reusing Resources – Open for Learning. This entry was posted in cetis, higher education, MOOCs, oer and tagged analytics, cetis, higher education, moocs, oer, policy. Bookmark the permalink.